The Aqua Smarte Plus Docking Station and Mineral Activator are both parts of the Aqua Smarte Plus System for maintaining healthy swimming pool water. The Docking Station is the central component of this advanced system. The Docking Station automatically controls the flow of pool water to the other parts of the Aqua Smarte Plus System, such as the Aqua Smarte Plus Mineral Activator and the Aqua Smarte Plus MizerMax Pac. NOTE: The Docking Station features a patented Control Dial that automatically controls the volume of water allowed into the system. While this Control Dial operates automatically, it will need to be initially set by the pool owner, but then can be forgotten until it's time to replace the Mineral Activator and/or MizerMax Pac. The innovative design allows for a continuously flow of chlorine at a determined level, saving time and money. The Aqua Smarte Plus Docking Station regulates the pool water that flows through the system. The Mineral Activator fits into this Docking Station, and along with the MizerMax Pac, acts as the water treatment center for your swimming pool. 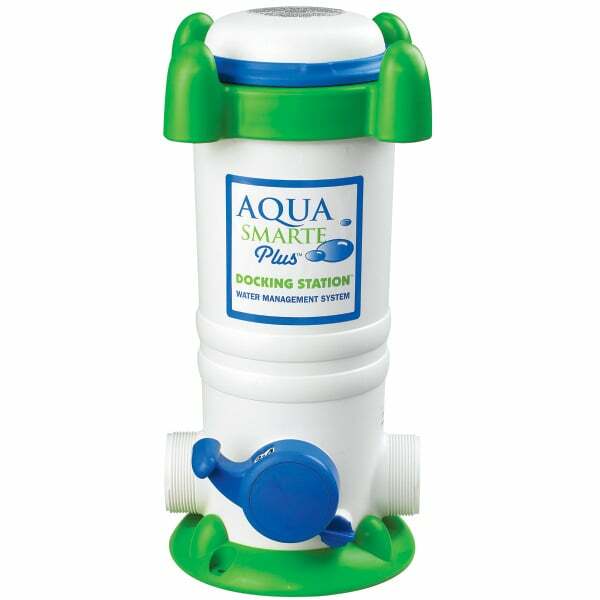 The Aqua Smarte Plus Mineral Activator holds the minerals and fits inside the Docking Station. The EPA-approved mineral formula replenishes itself on a regular basis; this constant replenishment protects your pool water from bacteria growth and balances your water's pH levels. These Mineral Activators should be replaced after a full season or every six months, whichever is shorter. The Aqua Smarte Plus MizerMax Pac (pre-filled chlorine pac) fits into Mineral Activator and releases small amounts of chlorine. It will help destroy bacteria and needs to be replaced every one to three weeks. The MizerMax Pac, when used properly, will cut chlorine usage by nearly 50% and grants you the ability to never touch a chlorine tablet again.